Now available in special set price: 2 kawaii lettersets from San-X Japan. Enjoy the true beauty of the Starlight Spica series. 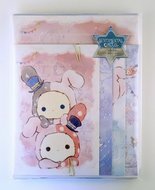 These kawaii lettersets with Sentimental Circus from San-X, Japan includes 32 sheets of writing paper (4 designs) and 16 matching envelopes each.